Regulations on raising and slaughtering animals vary widely in the East Bay. Here's what you should know. 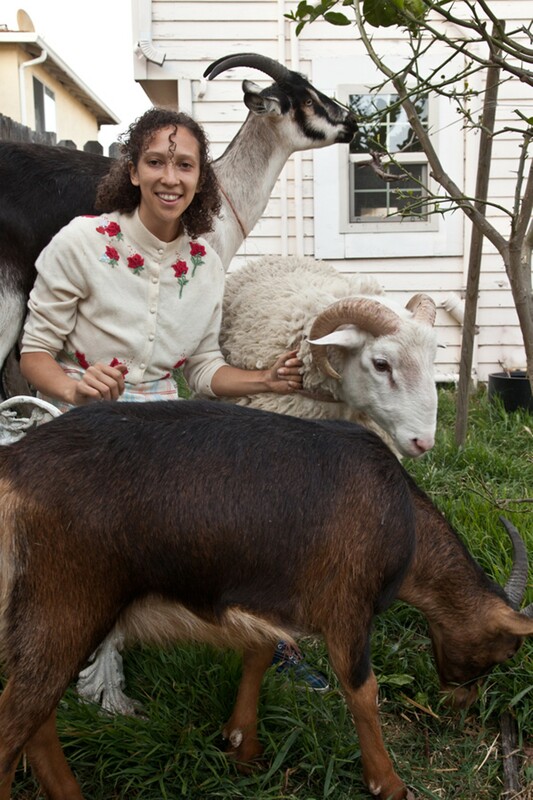 Mali McGee's goats and sheep aren't expressly prohibited in Alameda. The growth of the urban agricultural movement has prompted municipalities across the United States to reexamine their policies regarding urban livestock. The benefits of growing produce locally have been widely touted. But raising animals has proven to be far more contentious, given their potential for noise and odor, not to mention the sticky question of backyard slaughter. Urban homesteaders assert that animals are integral, necessary actors on modern urban farms, supplying fertilizer, disposing of unwanted bugs, and providing sustainable, humane sources of milk, eggs, and meat. Others question whether livestock belong in the city at all. Cities across the East Bay have chosen to address these issues differently, in ways that reflect the composition of their constituents and largely in response to the nature of their specific desires. "Aren't there any minimum agreed-upon standards for the humane keeping of certain animals in cities?" asked Alameda Deputy City Manager Alex Nguyen, who has organized a community group of local farmers to help draft new laws. "Apparently there aren't," he answered. Here's a look at different local laws. The city's original ordinances on livestock haven't changed since they were established in 1998. Individuals are required to apply for a $137 permit to keep up to six rabbits or six hens. If homesteaders want to raise more than six at a time, they are required to apply for a license — but city planner Anne Hersch said that she is unaware of anyone having ever done so, and estimated that five or six individuals applied for chicken permits last year. Chickens and rabbits must be housed at least fifty feet from neighbors, unless unanimous written consent from all neighboring parties has been given. "And because Albany is small and dense, most people end up having to get consent from their neighbors," she said. She could only remember one person ever applying for a permit to keep bees; it was granted, because she had "a particularly deep lot, about 240 feet." Animal slaughter is illegal without the permission of the city. Under the current regulations, goats are permitted exclusively for the purpose of "weed abatement," and they have only sixty days to get the job done. But on March 4, a group of citizens submitted a petition to amend regulations to the city council, expressing their desire to raise goats as livestock. The planning committee compiled an informal report in response, which they presented at a meeting on April 10. Citizens of Albany are also required to get a permit to breed their animals. Unlike Oakland city officials, Hersch has never heard of anyone owning a large mammal like an alpaca or llama in Albany. 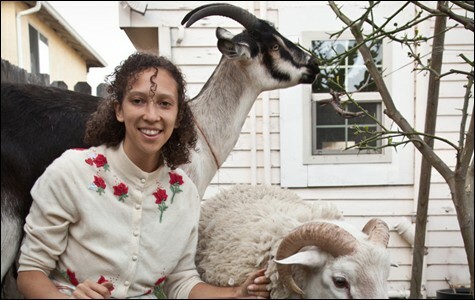 Mali McGee, a native of the East Bay, moved back to Alameda last summer with the three goats and two sheep she owns in tow. Under Alameda's current laws, keeping goats and sheep isn't prohibited. But it isn't expressly permitted, either. "We've been figuring out how to coexist with our neighbors and the city," she said. Nyugen described Alameda's current laws regarding livestock, some of which date back to the 1930s, as "woefully outdated." Last fall, he asked a group of seven urban farmers, including McGee, who were already raising bees, chickens, pigs, goats, and sheep in Alameda, to draft new ordinances based on their experiences. 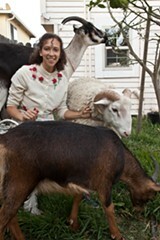 "Instead of having a bureaucrat or city planner come up with these regulations, we thought it was best to go actually speak with the people who already have these animals," Nyugen said, adding that he asked homesteaders to balance their needs and standards for humane treatment of urban livestock with the realities of living in a dense city, surrounded by neighbors. The backyard farming community group will present its draft at a community meeting on Thursday, April 25, at the city library at 6:30 p.m. for comment and input. Nguyen said he hopes to bring a final draft to the city council by mid summer. Berkeley's ordinances regarding urban livestock are explicit and detailed, despite having last been updated in 1918, according to Chapter 10.12, "Keeping, Care and Control of Animals." Rabbits, guinea pigs, chickens, ducks, pigeons, geese, turkeys and other domestic fowl are permitted, so long as they are kept in an enclosure, "no part of which is within twenty-five feet of any dwelling house occupied by human beings." Coops must be maintained in a sanitary manner in order to prevent "accumulation of manure or odor." Citizens are permitted to keep no more than two female goats over one-years-old, except in two specified zones. Sheep and male goats are illegal. Hogs are permitted, but only if they're kept 1,000 feet from any neighbors. There are no ordinances regarding slaughter. In November 2011 the city council formally adopted changes to its "Animal Ordinance," which had required citizens to apply for an expensive use permit to keep any animal "weighing more than three pounds, except a cat or dog, any fowl or bird weighing more than one-half pound ... or bees.'" El Cerrito's new laws allow citizens to keep chickens and bees "by-right" — that is, without having to apply for said permit. Citizens can keep up to four chickens on properties of at least 4,000 square feet, provided they apply for and are granted "residential chicken clearance," which costs $75. Chicken coops must be located at least twenty feet from adjacent buildings; roosters are illegal. With neighbors' unanimous consent, homesteaders who live on properties of less than 4,000 square feet may have up to four chickens; up to six chickens may be allowed for those who do have 4,000 square feet; and compromises can be made on the distance of coops to adjacent dwellings. Likewise, homesteaders can keep one beehive on properties of at least 5,000 square feet — provided that the hive is at least twenty feet from other dwellings — if they apply for honeybee beekeeping clearance. If homesteaders do not meet these conditions, written unanimous consent from neighbors can create exceptions. However, fowl other than chicken, goats, and pigs weighing over 150 pounds cannot be kept without use permits, which are much more costly (a conditional use permit costs $1,061, in addition to other associated costs). Senior Planner Sean Moss, who oversaw the process of updating the city's laws, estimated that four or five citizens applied for chicken clearance last year. To his knowledge, no one has applied to keep other fowl. "Chickens and bees were judged to be more appropriate for keeping in residential areas than other types of animals," he said. Chickens and bees are the most commonly kept urban livestock. Moss said that when the proposed changes were first read to the council, there was public comment both for and against the inclusion of a clause restricting animal slaughter, but the council ultimately decided it did not want to change the proposal. "The consensus was that the previous ordinance didn't address it, and it hadn't been an issue, so there wasn't a need to address it in the new ordinance. The code is basically silent on the issue of slaughter." Nearly two years ago, Oakland city officials pledged to update the city's zoning regulations in regards to urban agriculture after several prominent farms, including Phat Beets Produce and Novella Carpenter's Ghost Town Farm, were asked to pay expensive conditional use permits to continue their operations. Oakland's current regulations, which are sparse, date back to the 1960s and are scattered throughout its code. But according to city planner Heather Klein, slaughtering animals is informally prohibited. A community meeting held in July of 2011 by the planning department was attended by nearly three hundred people, and the issue of backyard slaughter was prominently debated. But progress on the "Urban Agricultural Zoning Update Proposal" has slowed because priorities in the planning and zoning department have shifted due to the impact of budget cuts and the impending completion of several large specific plans, said Strategic Planning Manager Ed Manasse. Esperanza Pallana, coordinator for the Oakland Food Policy Council, an urban farming advocacy stakeholder group who provided input to the city, cited the departure of former planning director Eric Angstadt in February of 2012 as another impediment. Unlike in other East Bay cities, the issue of backyard slaughter has been in the public eye in Oakland. The city is home to urban homesteaders who actively advocate for it and practice it themselves, as well as a vocal anti-backyard slaughter group, Neighbors Opposed to Backyard Slaughter. "What we want to do is determine the permissive amount of animals predicted to have the lowest impact on the surrounding community," said Manasse. "How many, and in what area, will create the highest likelihood that animals are being taken care of responsibly and not affecting neighbors? That's the crux. We share space with people of many different priorities." The Oakland Food Policy Council has received an internal draft of proposed new regulations from Klein, who is the project manager of the city's new urban agricultural zoning proposal. Pallana wrote in an email that the council is prioritizing items such as creating affordable operator's permits, delineating between different stages of urban agriculture, coming up with a glossary of terms, and defining animal processing as a personal food source. You don't need lots of money to raise your own food. Eco-friendly tips for stopping deer, raccoons, and squirrels from munching on your plants. From solar panels to concrete floors to airtight insulation, East Bay architects offer a plethora of eco-friendly options designed to cut down energy use.